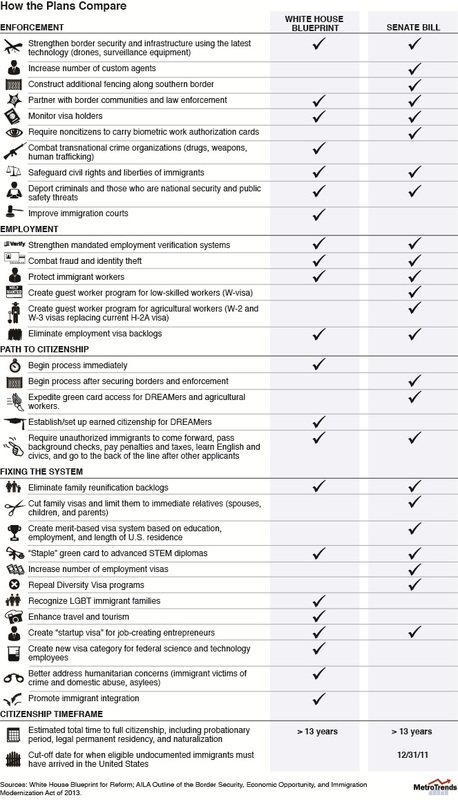 The Senate’s “Gang of Eight” released details of its immigration reform legislation Tuesday, so we have updated our earlier infographic comparing the White House’s immigration blueprint to the Senate bill. The president and the senators are, for the most part, in sync. But differences over a few key provisions will have advocates from all corners lobbying for their constituencies and will make for an interesting debate moving forward. The President prioritizes an immediate path to citizenship, while the Senate focuses first on secure borders and successful enforcement. Under both plans, it will take eligible immigrants the same amount of time—at least 13 years—to become U.S. citizens. The Senate bill cuts the number of family visas, which is of grave concern to immigrant advocates. It also repeals diversity visa programs. The President’s proposal includes LGBT families. The House of Representatives should offer their own bill shortly. It will most likely have the same contours.